A new game has finally made its way to Android, after what seems like a million requests from impatient YouTube commenters. 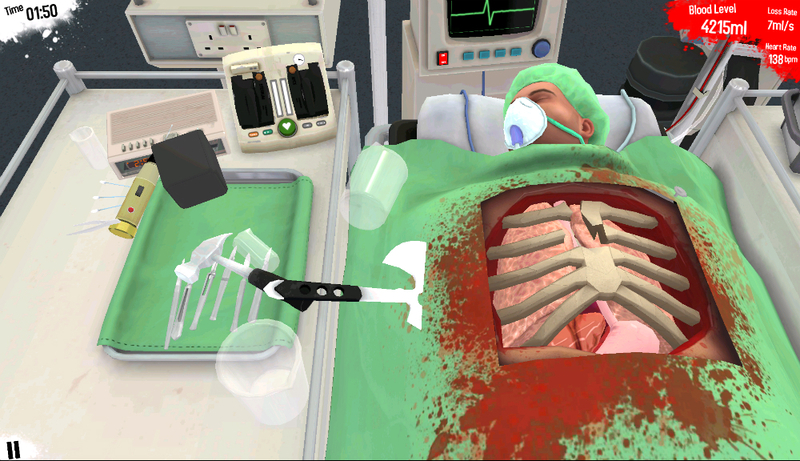 The game, titled Surgeon Simulator, is far from an actual realistic simulation game, but does deliver the thrill of slicing open a patient, bashing their ribs in with a hammer, and removing their worn out organs for new ones. If this was the way surgery was actually performed, I’d suspect Dr. Nick from The Simpsons was the resident surgeon at the time. Once you have passed the tutorial, then sign your medical license, you are thrown right into a heart transplant operation. If you notice the controls are nearly impossible, don’t worry, they’re supposed to be basically unusable. Using a combination of two finger commands and single finger swiping motions, you crack open the patient’s ribs, revealing his fleshy organs. Don’t worry if you leave your hammer inside his gaping chest opening; it won’t kill him. The game plays great, minus the caddy wompus controls, but the graphics are good, plus the music is great. For $5.99, I highly recommend it.